The Acco Work Rated American Made Wire Rope Hoist design results from years of Materials Handling Engineering and Manufacturing knowledge and Experience Utilizing Space age techniques and Materials while retaining the Superior Design Features and Quality of Current Hoists. 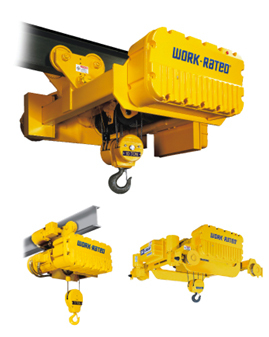 The Acco Work Rated Wire Rope Hoist is equipped with an Overload Cutoff that protects load, hoist and operator by interrupting raising circuit when hoist senses a damaging overload. When lifting circuit is interrupted, the lowering circuit remains intact to allow the load to be lowered and removed. After the overload is removed the lifting circuit is automatically restored. Overload Cutoff is accessible for field adjustments. 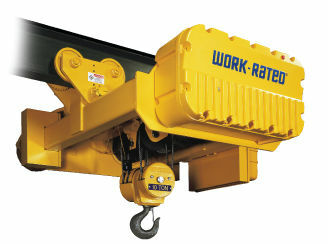 Each Acco Work Rated Heavy Duty Hoist is available with single or two speed. Magnetic revering contactors, both mechanically and electrically interlocked. 115V control circuit. Meets NEC requirements. NEMA 3R enclosure. Lightweight, durable and easily accessible. The Acco Work Rated Wire Rope Hoist is equipped with an American Made Motor Brake that has been proven in millions of hours of in-service operation, the original Wright rectified D-C magnetic-actuated disc brake delivers rapid stops with virtually no hook drift. Rated a minimum of 150% of full load motor torque. Exclusive brake-sensing microswitch prevents motor from operating against engaged brake and when brake requires adjustment. The Acco New Century Series Acco Wire Rope Hoist utilizes a U.S. manufactured motor. 30 minute duty, Class F insulation. Standard single speed motor is povided for 230/460 or 575 3 phase, 60 hertz power supplies. Motor thermostats are standard - providing both running and overcurrent protection. Each Acco Wire Rope Hoist has machined grooved and large flanges for smooth winding and extra rope life. At least two full turns of rope remain on the drum at the low hook position. All Acco Wire Rope Hoists are equipped wtihan gravity type upper hook travel limit switch comes equipped with an automatic momentary lowering circuit. All Acco Hoist Gears operate in the largest oil reservoir in the industry and are enclosed in a rugged fluted aluminum alloy housing. The oil bath and housing combine to provide rapid heat dissipation, an important aspect of achieving the high volume hoist duty of an H4 classification. Oil sight gauge on housing cover permits quick visual inspection. All Acco Heavy Duty Work Rated Wire Rope Hoists are equipped with an automatic Weston Type multiple disc brake, carried forward from the original Work Rated design. It can hold a full capacity load independent of the motor brake and assures that the load does not accelerate while being lowered. Adjustment is not required. Quiet, helical and spur gearing. All gears are machine cut, case-hardened alloy steel with shock-resistant ductile cores. Designed to AGMA standards. Thank you for the opportunity to quote your next project. Please fill out as much of the form below as you can and we will reach out to you as soon as possible.